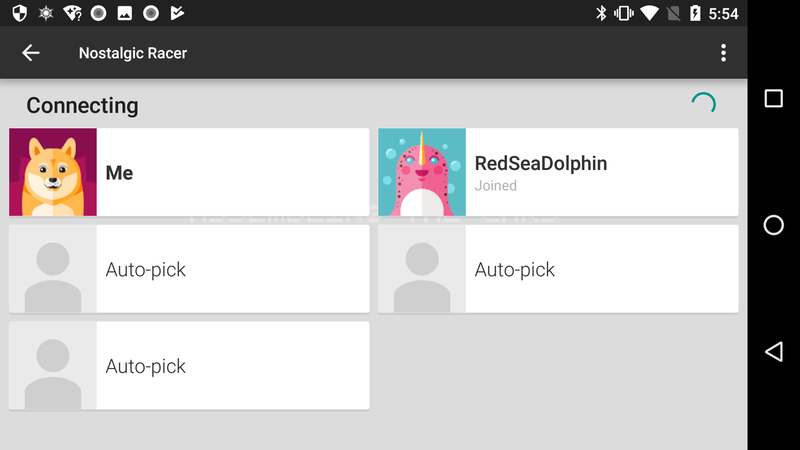 This guide shows you how to implement a real-time multiplayer game using the Google Play games services in a C++ application for Android. 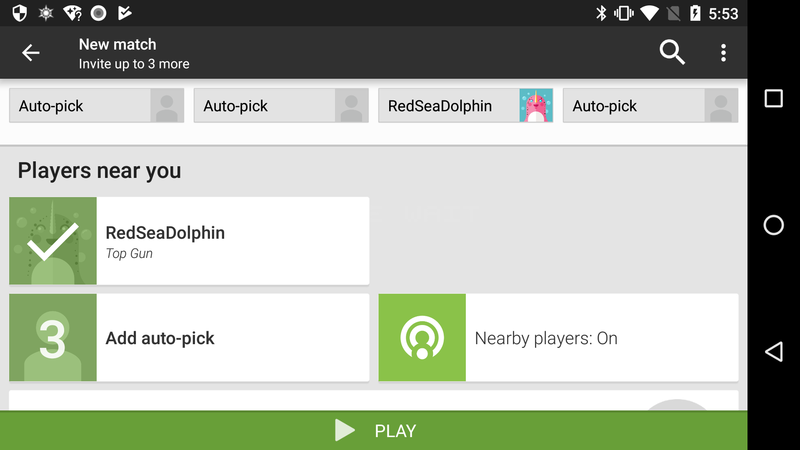 Enable real-time multiplayer support for your game in the Google Play Console. Download and review the real-time multiplayer game code samples in the samples page. You should also familiarize yourself with the best practices described in the Quality Checklist. Your game can start using the real-time multiplayer API once sign-in to Google Play games services is successful, and the game has fired the GameServices::Builder::SetOnAuthActionFinished callback, reporting a success status. Note: Adjust the button labels to best suit your game's context. For example, "Quick Game" could be renamed "Quick Race". When the player selects the Quick Game option, your game should create a room object to join players, auto-match the player to randomly selected opponents without displaying the player-picker UI, and immediately start the game. // shows the built-in waiting-room UI. // The room is set up. Proceed with gameplay. When the Invite Players option is selected, your game should either launch a player-picker UI that prompts the initiating player to select friends to invite to a real-time game session, or select a number of random players for auto-matching. The game should create a virtual room object using the player's criteria; once the room status changes to RealTimeRoomStatus::ACTIVE, the game session should begin. To obtain the user's selection, your game can display the built-in player-picker UI provided by Google Play games services (default) or a custom player-picker UI. To launch the default UI, call the RealTimeMultiplayerManager::ShowPlayerSelectUI method. // Your code to handle the users's selection goes here. An example of the default player-picker UI is shown below. Before you can actually create a RealTimeRoom from the config, you must create a listener interface that will receive notifications about the room. Do this by by implementing the virtual methods of IRealTimeEventListener on one of your classes. // Your implementations of IRealTimeEventListener. More discussion of these methods appears in the sections below. The RealTimeRoomResponse returned from the async callback provided to CreateRealTimeRoom notifies the game of any errors. If a room-creation has error occurred, your game should display a message to notify players, and return to the main screen. // We got an error, notify the user. // Handle other statuses if appropriate. Warning: The RealTimeRoom object passed to a callback may not be the same as the object passed to previous callbacks. If your game keeps a reference to the RealTimeRoom object, it should update that reference whenever it receives a callback that includes a RealTimeRoom argument, such as OnParticipantStatusChanged or OnConnectedSetChanged. Using an out-of-date RealTimeRoom object may return stale information or cause other problems. // connected or disconnected (.IsConnectedToRoom() has returned `true` or `false`). OnP2PConnected and OnP2PDisconnected methods provide notifications of direct connections to other participants. Most gamescan safely ignore these notifications. They may be useful for games that wish to start communicating to other users before the room is fully connected. // Our game is simple, so ignore this callback. We recommend that your game use a "waiting room" UI so that players can see the current status of the room as participants join and get connected. Your game can display the default waiting-room UI (shown in the figure below) or a custom UI. To launch the default waiting-room UI, call the ShowWaitingRoomUI() method. Your game can launch the waiting-room UI from the asynchronous callback provided to CreateRealTimeRoom or AcceptInvitation. MultiplayerStatus::VALID - All invited players were successfully connected to the room. MultiplayerStatus::ERROR_CANCELED - The player backed out of the UI. MultiplayerStatus::ERROR_LEFT_ROOM - The player selected the Leave Room option. You can implement a different response depending on whether the user explicitly canceled the game (ERROR_LEFT_ROOM or quit the waiting-room UI (ERROR_CANCELED). If you use the waiting-room UI, you do not need to implement additional logic to decide when the game should be started or canceled. A game can start right away on receiving a MultiplayerStatus::VALID result, since the required number of participants have been connected. Likewise, when you get an error result from the waiting-room UI, you can simply leave the room. The MultiplayerParticipant.Status() method returns the current status of the participant. ParticipantStatus::INVITED: The participant has been invited, but has not responded. ParticipantStatus::DECLINED: The participant has declined the invitation. ParticipantStatus::JOINED: The participant has joined the room. ParticipantStatus::LEFT: The participant has left the room. Your game can also detect if a participant is connected by calling MultiplayerParticipant.IsConnectedToRoom(). Make sure to construct your game logic carefully to take each participant's status and connectedness into account. For example, to determine if all racers have crossed the finish line, your game should only consider the participants who are connected; some may have left the room or never have accepted the invitation. Your player might be disconnected from the room due to network connectivity or server issues. To be notified when a player is disconnected from the room, implement the OnConnectedSetChanged method. // Check the room's participants to see who connected/disconnected. Once the player has signed in, your game may be notified of invitations to join a room created by another player. The game should handle such invitations. To be notified of incoming invitations, your game can register a callback via the SetOnMultiplayerInvitationEvent method when configuring GameServices::Builder. Incoming invitations do not generate a status bar while a game is open. Instead, the callback is notified, and your game can then display an in-game popup dialog or notification to inform the user. If the user accepts, your game should process the invitation and launch the game screen. // Show the waiting room or take other action on room join. The Invitation Inbox is an optional UI component that your game can display using RealTimeMultiplayerManager::ShowRoomInboxUI. The Inbox displays all available invitations that a player received. If the player selects a pending invitation from the Inbox, your game should accept the invitation and launch the game screen. Review Sending game data to familiarize yourself with the concepts behind using the real-time multiplayer API for data messaging. Note: Your game can only send messages to connected participants. To know when peer clients are connected, your game can monitor the OnConnectedSetChanged callback. To send a message using an unreliable protocol, use RealTimeMultiplayerManager::SendUnreliableMessage. To send a reliable message, use RealTimeMultiplayerManager::SendReliableMessage. The following example shows how to broadcast a score, using either a reliable or an unreliable message. The user cancels the game in the waiting room. The response code returned from the ShowWaitUI UIStatus::ERROR_LEFT_ROOM. // We left successfully. We can now join another room.